The Pinyon smelled so good when I crushed it. I imagined that this is the smell of the heart --of love being released. Like some psychic homeopathic remedy, heart break put me on the path of kindness and compassion, and made me reconsider the evidence of love. I'm going to survey regulars who live and work here: What creative thing could be done to change patterns of neglect and violence on our corner? I was searching to find out about mending to restore some of my favorite clothes. I have some Levi's jeans that need mending and a really cool vintage denim Levi's western shirt I have had since late 1980's that is really frayed at the collar. 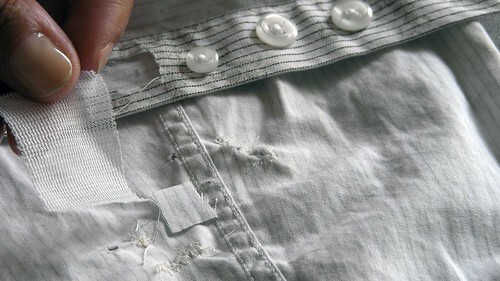 I wanted to learn to repair clothes but first was wondering if it is possible to repair a shirt's collar? Does one need a sewing machine? Your advice would be greatly appreciated. If you want I can send pictures. No you do not need a sewing machine. Hand sewing will work just as well, but it takes more time. In my opinion, the work of the hand signifies devotion, and there is a certain amount of devotion inherent in wanting to mend a favorite shirt. There are a several options. Try slipping the gingham fabric behind the frayed fabric and then use running stitches to hold the piece in place and a blanket stitch to secure the frayed edges as I did with the gold and orange fabrics in the image above. OR do the same thing but without the gingham fabric, just secure the fragile areas with decorative stitching as I did on with the waistband of these jeans. Or make a couple of long patches from the gingham, turn the edges under and pin them in place. 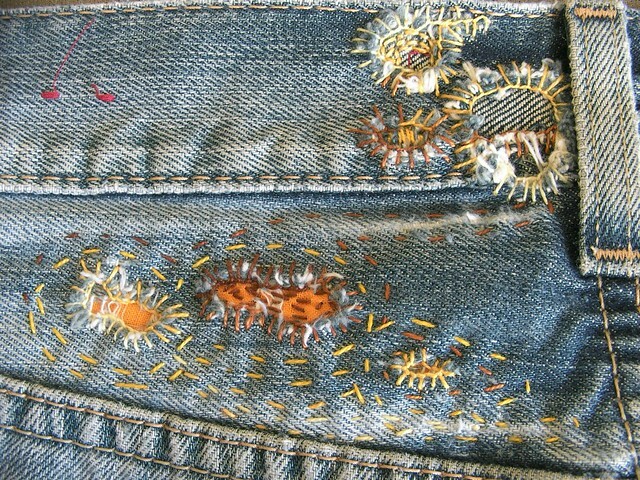 Then appliqué the patches on top of the frayed sections. Use decorative embroidery stitches when sewing the patch in place, to make something beautifully unique out of the worn out places. I've been trying to figure out your finishing technique. I don't like to put bindings on my work. How do you finish yours? Could you suggest a tutorial? I use an invisible or reverse binding on many of my quilts, especially wall hangings. 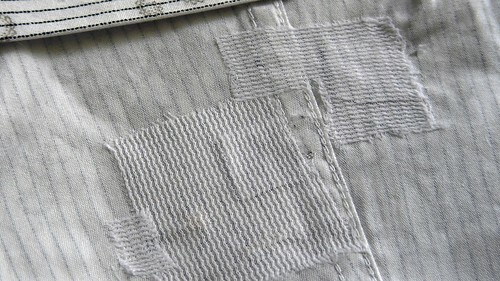 I'm happy to say that I have written and posted an invisible or reverse binding tutorial right here on daintytime.net. ps. 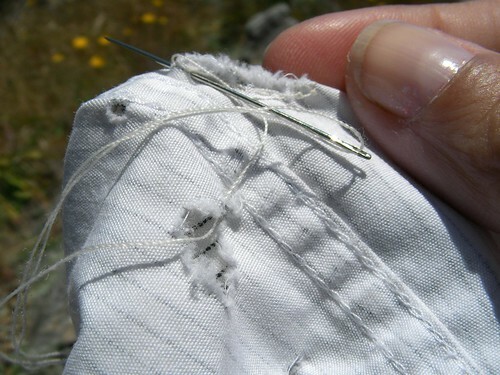 If you have any mending or binding suggestions, please do share your tips in the comments. 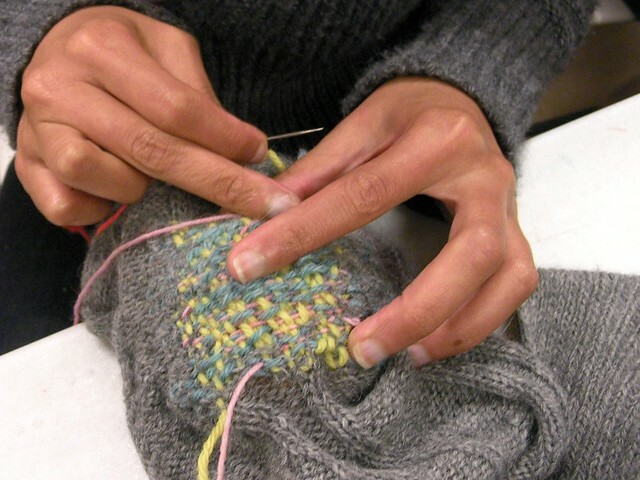 Groups of knitters are fantastic, funny, and so appreciative of the effort anyone makes to knit. 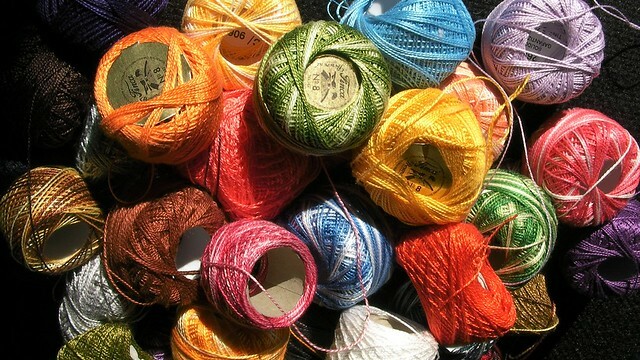 The love of yarn and craft is an instant bond. Thanks to all who entered the Mend It Better Giveaway with your AWESOME advise on How To Mend A Broken Heart. If you had x-ray vision you could look through the jeans, linen, and corduroy to the little patch of scar tissue on the corner of my knee! The 10th anniversary of 9/11 is upon us, the war is still raging and I am still stitching the names of the dead onto these prayer banners. 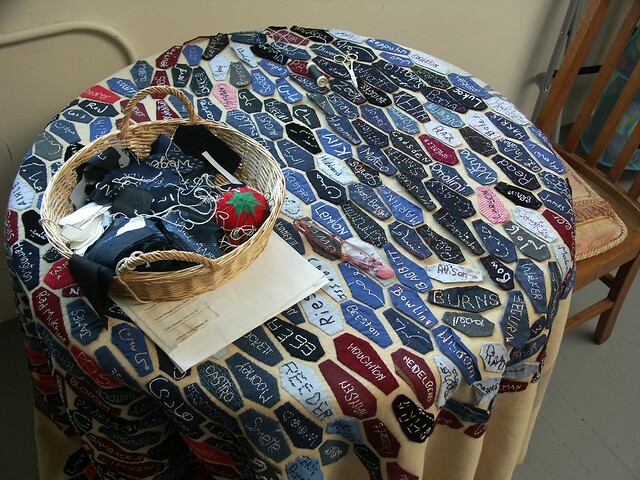 Many of you helped stitched names on navy blue coffins, during the virtual sewing circle I held last year. Now I'm working to hand stitch those coffins on the banner to spell the word MERCY. When this blanket is full of coffins, the coffins on the next prayer banner will spell the word GLORY. The Prayer Banners will be hanging at St. Gregory of Nyssa Episcopal Church in San Francisco next Sunday on the 10th anniversary of 9/11. 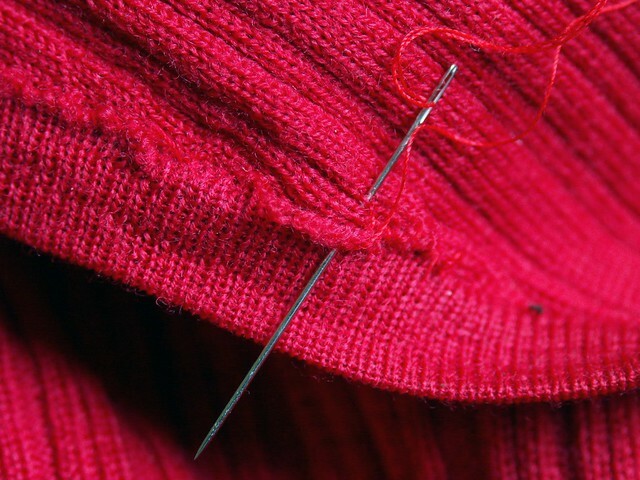 There will be a participatory sewing circle in the sanctuary between liturgies, from 9:30 - 10:20 AM. I started this mourning meditation in 2003. For more about the project's meaning and trajectory visit Prayer Banners: REPENT / MERCY / GLORY. 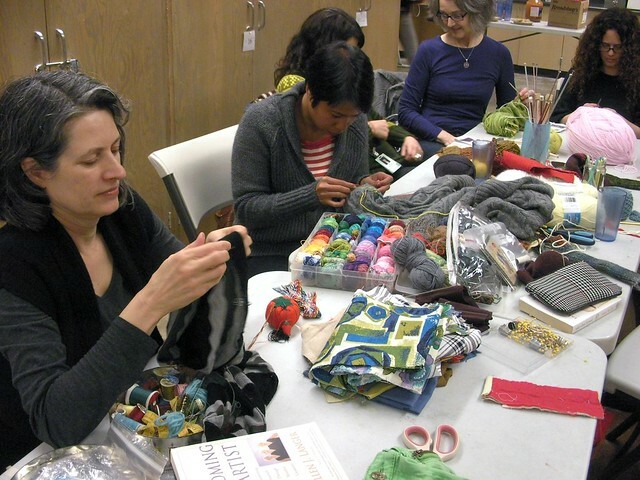 What a terrific day of mending, darning, knitting and crocheting at the Harvey Milk Center in San Francisco. The free mending workshop was part of the How-to-Homestead 11 in 11 Tour, and all sorts of folks turned out, even a few men! Mending alone can feel like a burden, but there is hardly anything more satisfying than mending with others. The time flew by as people rolled in with their items in need of repair, including coats and jeans with ripped lining or seams, cherished sweaters and shirts with worn out elbows. Some people came to learn how to knit or crochet. Skills shared and mastered included back stitch, whip stitch, blanket stitch, running stitch, surface mending, darning, crochet and knitting. Everyone who participated left uplifted, with a lightened load, a sense of fellowship, and a feeling of accomplishment. 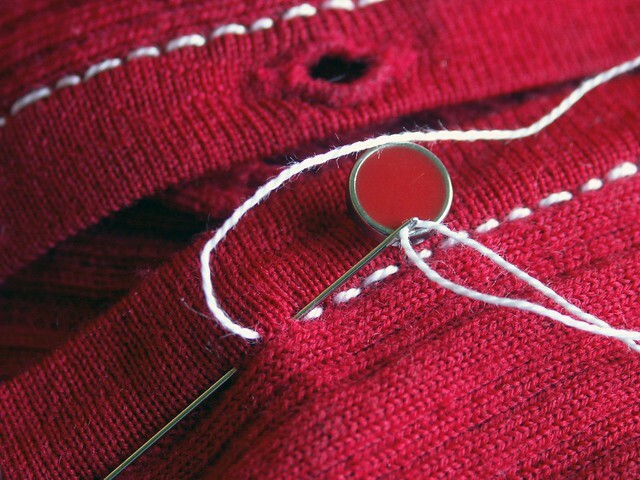 If you are in the Bay Area join me for a free mending workshop this Saturday. It's the first event in a line-up of homesteading fun at the Harvey Milk Recreational Arts Center, organized by the amazing Melinda Stone. I hope to see you there! How-to-Homestead lands at Harvey Milk Recreational Arts Center in District 8 on March 5, 2011. Get ready to mend your clothes and do-si-do, not to mention enjoy a potluck and films with live music. Harvey Milk Center is located at 50 Scott Street, corner of Duboce Ave, San Francisco. Five dollar suggested donation, FREE if you bring potluck. 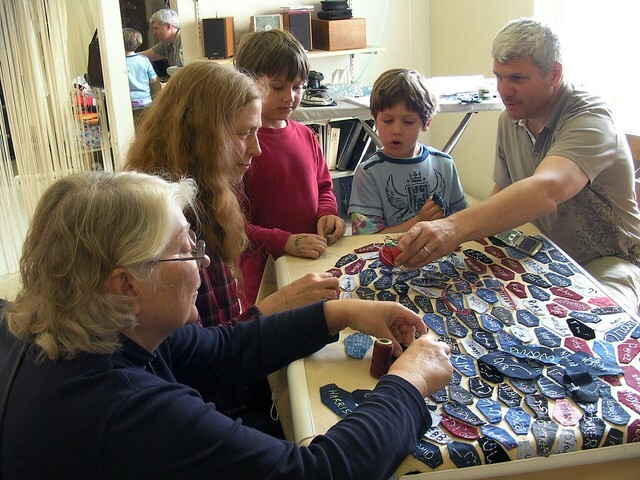 2PM – 5PM: Drop-in mending workshop. 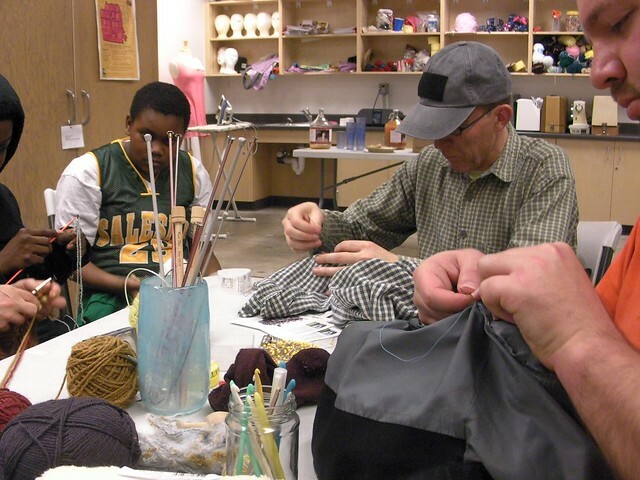 Sherri Lynn Wood, extraordinary handicraft artist, leads a one-of-a-kind intimate mending workshop, starting at 2PM. Bring your holey jeans, socks that need darning, or your favorite threadbare sweater– all will be uplifted. Also bring material for patching and a cheap paperback novel. Thread, needles and refreshments will be provided. 6-7PM: Potluck, bring a dish to share. 7PM: How-to Homestead short film program with live musical accompaniment. 8PM: Square Dancing with The Stairwell Sisters The Stairwell Sisters, Evie Ladin, Stephanie Prausnitz, Lisa Berman, Martha Hawthorne, and Sue Sandlin, crank out acoustic, old-time music with a punk-rock intensity. They have appeared on A Prairie Home Companion and many festival stages from the Lincoln Center (NYC) to Hardly Strictly Bluegrass in San Francisco. They will lead a rousing night of square dancing at Harvey Milk on March 5, so get ready to do-si-do. No previous experience necessary. Wrapping my head around the concept of surrender was proving impossible, until I committed myself to playing the role of the coat, rather than the mender. I have a favorite coat I've been wearing for at least 12 years. It was made in Paris, but I received it second hand. I have a favorite life. It's the one that I'm living every day. Like my coat it's become worn with stains and riddled with small holes over time. Mend-along with me as I repair my coat and my life during a time of transition. Mending my granny squares isn't exactly like minding your p's & q's, as many teachers and grandmothers have been known to say to rude and unruly children. 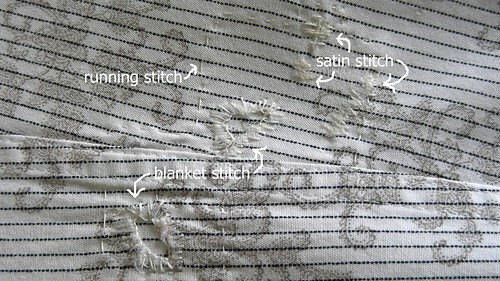 There is nothing ruled about this mending job. My approach is completely freeform. Thread a needle with yarn and stick it through any section of the granny squares that have frayed and come undone. And then gently pull to draw the separated sections together. I guess you could say that the granny squares subjected to my mending frenzy are being made to mind their p's & q's. Except they don't listen. Every time I wear this beautiful but fragile jacket another hole sprouts up somewhere. It's a constant conversation. Mending my granny squares requires a certain amount of inner acceptance that the worn and frayed (within me) will continue to err, and need my gentle, patient attention to keep things whole and transforming. 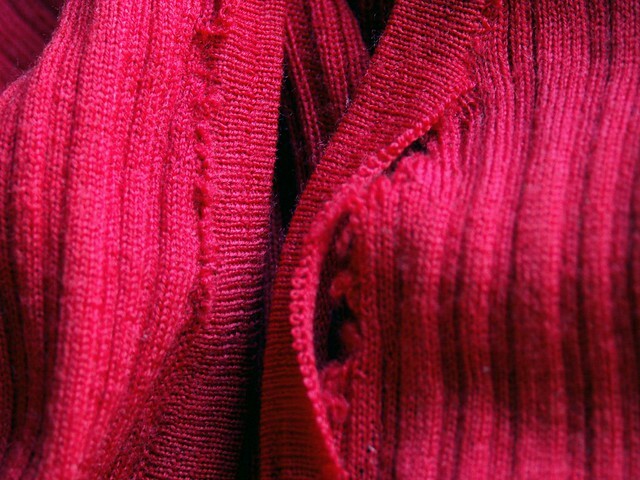 Using a needle and a blendable yarn I catch any frayed and unattached sections, and gently pull them together. Knot in the back and weave the thread. The sleeve edge was particularly frayed. I used a crochet hook and re-croched the edge. Finally I added a large grey button at the top to hold the jacket closed at the neckline. 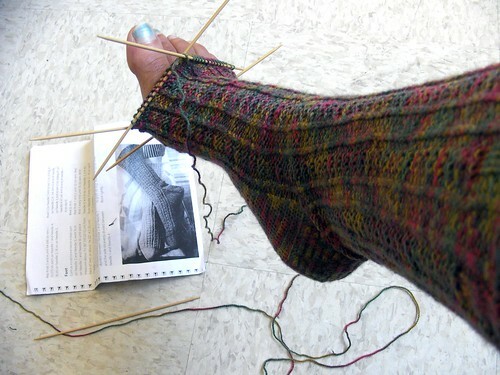 There are days in my studio when all I can do is knit. Especially on difficult emotional days when everything seems wrong, every cell in my body feels worn, and my mind can't think through the fog. 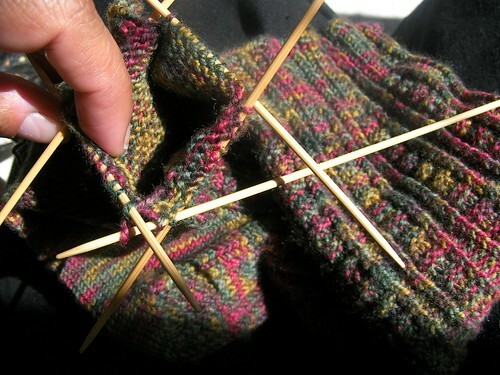 On those days I sit near my studio window and knit in the sun... knitting and mending. The solstice ritual is over. The shirt is off the mountainside and on the operating table. No more dreaming of mending and daisies. 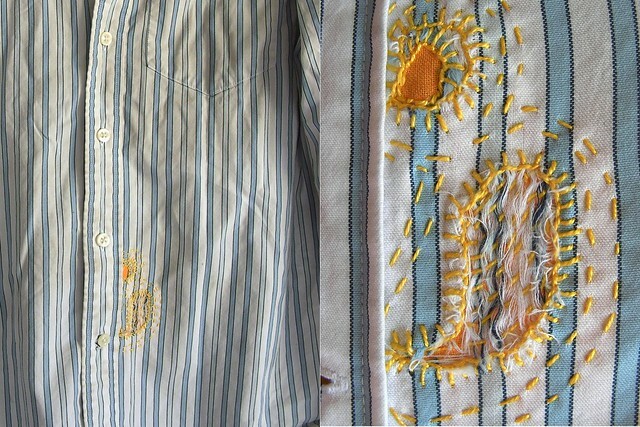 Wrong side up - I had to surgically remove two small portions from the inner placket of the shirt-tail to use as patches for the two major moth eaten holes in my boyfriend's shirt. Right side up - I used a blanket stitch to mend the major holes, and a satin stitch for the minor bites. I used a running stitch around the edge of the interfacing to hold it in place. Wah-lah! and it's ready to wear! I hope he get's the job. Sometimes mending requires anonymity. It can't be known or visible to others. It's not social, but best done in quiet contemplation, alone and with simplicity. It is the longest day of this year in my short life, the first day of summer. I don't want to spend it in the office or even in my studio. Instead I'll take a long hike in the Marin Headlands. My mom's ashes are scattered over these hills. I'll visit her and do some mending. I'm walking in my spirit, I'm walking in my spirit... I'm walking and focused on each step, on the sounds and smells that fill the air, on my breath. My mind settles into the rhythm of attention. The tiny moth-eaten holes in my soul are patched with yellow daisies. My boyfriend has a job interview next week. He pulled out one of his two dress shirts and discovered that it had been munched. I did a little bit of stitching on my hike but discovered that this chomp job needed some serious time on the operating table (ironing board).